Creative Casting Company can make copies of your antique bathtub feet. Just send us an original and we can make copies out of silicon bronze for $45 a foot. 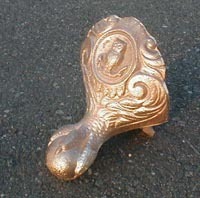 (Some large or difficult to cast feet may be more) The silicon bronze is stronger than cast iron, won't rust and is easier to pour than cast iron. We leave it as a wirebrushed cast bronze finish but it can be plated, polished or painted. We do have a lot of styles in stock but because of the wide variety of attachments, tub slopes and size of the legs it is usually necessary for you to send us your original to copy. Some legs do have numbers or letters on the back so you if you are lucky you can just E-mail us what you need. I have taken pictures of most of our collection and labeled them so you can match up your leg. Here are the Clawfeet Pictures. If you do not have any legs for your tub then you need to try some on to find one that will fit. You can try building salvage yards, or bathtub refinishers. We sell to bathtub refinishers all over the country- check this list of bathtub refinishers to see if we know someone that is near you. If you live near Tacoma, just put your tub in your pickup and come try some legs on at our foundry. If you can't find one that fits your tub then we won't be able to help you.